Authorities detained a Yemeni man in their almost yearlong investigation into the bombing of a U.S. destroyer in the southern port of Aden, an official close to the Yemeni investigators said Wednesday. 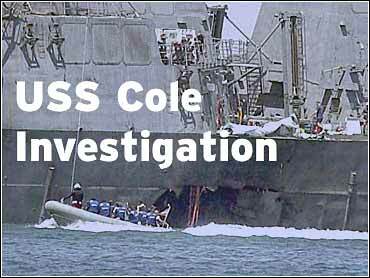 The official, who spoke on condition of anonymity, said the man was transferred last week to the same San`a prison where eight other suspects are being held in the Oct. 12 bombing of the USS Cole, which killed 17 American sailors, the official said. It was not immediately clear if the man would join the eight as a principal suspect. However, it was considered significant that the Yemeni  deported in August from a Horn of Africa country  was being held with the eight others, said the official, who did not elaborate on why the man had been outside Yemen. If he becomes the ninth suspect, it would signify the investigation's first major arrest in months. Most of those being held were arrested shortly after the attack. The official said the man was deported to Aden for interrogation and moved to San`a last week. Yemeni officials have said the investigation into the Cole bombing was complete and the government is ready to begin the trial against the eight suspects. However, the United States has asked Yemen to delay the trial to give its investigators more time to search for the attack's culprits. The United States believes exiled Saudi dissident Osama bin Laden is behind the Cole attack. He also is the main suspect in the Sept. 11 terrorist attacks on the United States. In a separate development Wednesday, police detained four Yemenis who led a protest of about 150 people against this week's U.S. airstrikes on Afghanistan, a security official said on condition of anonymity. The strikes are aimed at terrorist camps of bin Laden, who is sheltered by Afghanistan's Taliban government. A relative of the detainees said the four had organized the demonstration without official permission in the town of Hejah, 106 miles north of the capital, San`a. Most of the protesters were students from a local teachers' college. The relative declined to be identified. The government has increased the number of police on the streets in Yemeni cities since the Sept. 11 attacks. There are more police on guard outside U.S. and British embassies and consulates and at airports and ports.